While selecting for these traits, our goal is to keep a moderate mature size. We keep and develop all of our own replacements so we demand fertility and udder quality. Sally’s five daughters are often her help on the farm. Her daughters range from age 9 to 24; because young children are always around the cow herd, we have an extremely low-tolerance for disposition issues in our herd. Besides, with six ladies on the farm there is no extra room for drama or attitude from the cows! If one of our cows acts up, she’s gone. Our customers often seek to use the Charolais breed because of the high-growth and muscle it can provide. Our bulls deliver on both of those traits. The bulls are developed in large pastures with the goal of maintaining their soundness and athletic ability. 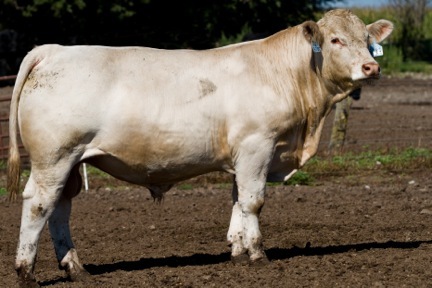 Angell Charolais bulls complement British cows, adding thickness and growth to provide head-turning feeder calves. 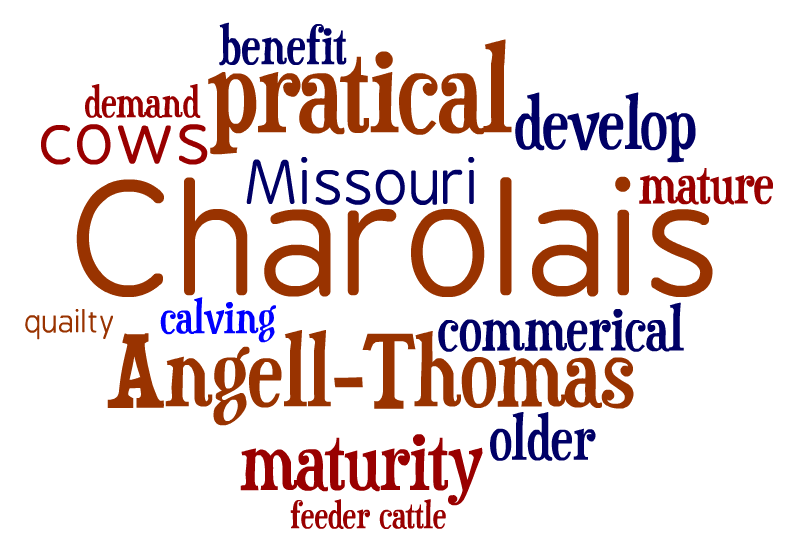 Currently, Angell-Thomas Charolais has 110 females. After years of fighting the spring rain and mud, we converted 80 percent of the herd to fall calving and only 20 percent for spring calving. We found that fall calving not only saves our family’s sanity, but it also gives the bulls a few extra months to mature and develop before we put them up for sale. This was a good change for us. We enjoy selling the bulls at an older age, knowing they will be fully mature and provide fewer issues for our customers. The solid foundation gained from our genetic selections provides user-friendly bulls. Our bulls are grown on test at Rodger’s Valley Farm in Mendon, Missouri. They are developed in a feedlot environment, but they are grown slowly and not pushed. After the test is completed, they return to our farm. They are kept on grass and supplemented with grain. We don’t sell spoiled bulls; we manage them on our farm just like you will at yours. Our goal is to sell bulls that will perform, not melt down. We have synchronized our fall calving herd the past four breeding seasons with CIDRs and follow with our clean-up bull. We demand fertile cows, and if one comes up open, we send her to the sale barn. This strict culling policy has served us well. In 2012, at pregnancy checking time, the vet found only three open cows in the entire herd. Two were older cows that we had already planned to sell. This example shows the fertility-level and quality of the Angell-Thomas Charolais cows.